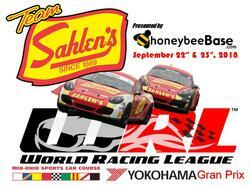 Team Sahlen will be entering a World Racing League event for the 3rd straight year. Just like last year, Team Sahlen will be competing with the series at Mid-Ohio Sports Car Course. At this event last year, the team’s Porsche Cayman secured the overall victory against stiff competition from an Elan Prototype. When Team Sahlen 1st raced with World Racing League 2 years ago, it was at the Gingerman Raceway circuit in Michigan. In this event, Team Sahlen campaign their Mazda RX7s, and were able to come out with a 1st and 2nd Overall result for the weekend’s long 7 hour endurance event. Now this year Team Sahlen will shooting to secure an Overall Victory in World Racing League competition for the 3rd consecutive year. As always, the competition will be tough. Additionally, there are always a malady of incidents and mechanical issues that can occur when racing for 8 hours at a time. The weekend will begin with the Saturday race that starts at 8:30 am. This will be the 1st of the double header 8 hour endurance events. After the Saturday race is complete, all the teams will get back up on Sunday for another 8 hour endurance race.